Springsteen is seen speaking to the audience member holding up a sign which read: "Missed school in the s**t now, can I play Growin' Up with you?" 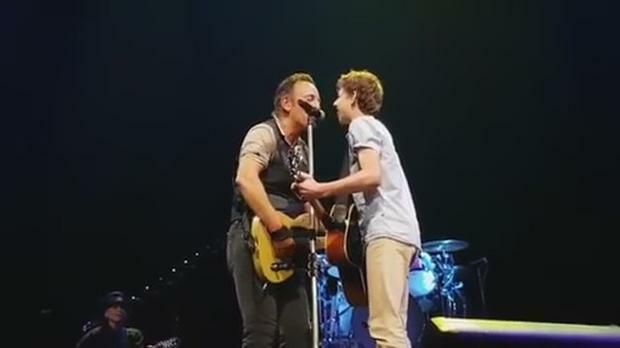 Springsteen tells him to "come on up" and it turns out that not only can the teenager - called Nathan - play the song on guitar, he can sing it in a decent pitch as well. Springsteen, clearly loving it, joins in and there are several moments where you can see Nathan looking around in utter disbelief. "Before we continue," Springsteen says, bringing the band down, "a lesson". "When I was your age, I got my first guitar, I brought it home and I realised, it wasn't how well you played it, it was how good you looked doing it. "So I got in front of the mirror and I tried out some different poses." Springsteen and Nathan then tried out a bunch of different stances before the legend said "and when you find one, it sounds like this"... and they brought the house down.